His story shows how you can always build a company and succeed, regardless of your age. At 22 years old, he owns his own business and helps his brothers, all thanks to an entrepreneurial and personal development initiative. 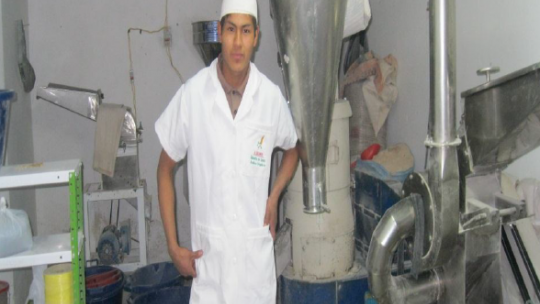 Benjamin entered the company as a machine operator, which processes different grains. The opportunity came to him when the owner of the company, one day decided to sell the machines. Benjamin decided then to buy them and build his own business, even at his young age. The challenge was to raise the money to buy the machines, but luckily the owner of the premises where he worked, offered to lend him the money for the purchase. He accepted the challenge, to buy the machines, running a business and fulfill the commitment to repay the loan, although interest rates were high. Now he is an local entrepreneur with new desires like having his own room and a bigger ground to install all his machines. By having a rented room, he can’t participate in contests to be provider of food governmental programs, which are for example school breakfasts or the "glass of milk". Another future challenge is to buy more equipment to implement his business, and thus offer more services to his customers, and participate in tenders that exist in his area. Because of his young age, many mayors and potential buyers doubt about his responsibility and the quality of his products; so he now plans to take his business to the most top. Currently, he makes work his younger brothers on weekends but he still supports their studies at all times. In the future he would like to take his business to the top, and create another company making clothing, a sector where he also has experience. Benjamin is now requesting a loan to buy raw materials, and so continue to grow his business : help him !